A King on the left side and a Queen on the right standing in an open landscape. The King holds a sceptre in his right hand and the Queen holds a three-blossomed flower in her right hand and a peacock feather fan in her left. In front of the King a wolf or jumps over a triangular crucible placed on a basin of fire. In front of the Queen, and old man with a scythe and crippled leg (a Saturn figure) steps across a fire on which a vessel (Cupel) is being heated. «The King and the Queen of the Work, that is, the gold and the philosophical silver, spagyricaly designated by the wolf and the great metallic button on the cupel. 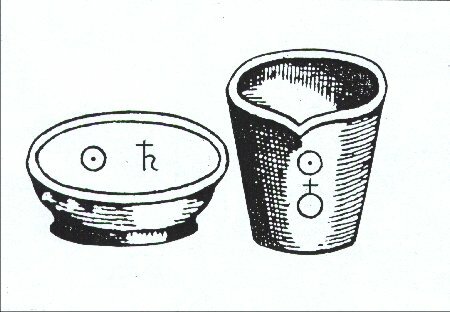 Having in account that the commentator says and also Albert Poisson in reference of the figures of woodcut, everything would take us to conclude that the King represents the gold that will be purified by the Wolf and the Queen the silver also it purified by Saturn on the cupel, as one can see for the metallic button. This purification process of the two noble metals was very usual in that time. This is a possible interpretation which to the first view, it seems the most appropriate and for a long time we accept it but with reservation. If you read carefully the text of this first key, you will see that the Master does not make any reference to the purification of the Queen. He refers, just, to the King’s purification and of there our doubt. Never accept willing the comments of the translator and commentator, (French edition) author of several books about our Art, that we respected to much, because they are not agree with the text and we find very strange that he did not make that repair. Later, we acquire Basil Valentine’s last published book, "Le Dernier Testament" (The Will and Last Testament). As the title indicates, probably, it will have been one of the last ones, Master’s book and perhaps that, one of the most generous and clear. In referred book, we confirmed our reservation because the Master describes in clear language some of the keys of his book "The Twelve Keys" that, in the original, as we saw, are described in symbolic language. The purification of the gold is made so that it is beaten well slim and very thin, then, molten and melted three times for the antimony, that after the King melted with antimony steady in the bottom, be recast before to be blown with very strong fire and then, purified by Saturn. The text is clear and it does not place to any doubts. Only the King and just the King it is purified by the antimony or grey Wolf (the wolf jumping over the crucible) and, then, gone by the Cupel by means of Saturn (the old with a crippled leg with a scythe), having a cupel under with a metallic button of purified gold as shows the illustration. As Key text refers, Saturn it is the seventh city in the Celestial firmament (seventh alchemic planet). The Wolf, represent symbolically the antimony and Saturn the lead. Now I ask yours: Why in the figure of First Key the King and Queen they are together if in the text the Queen has not any role? Where in part of the text he said that the Queen is united to the King when and how? Nowhere. Only the King is purified three times (the three flowers) by antimony in a crucible and after by lead in the Cupel as you can read in text. In the Second Key we will see why.